Silver Medal: Cufflink, for his lyrical portrait of a lonely man in a lonely place whose dream of love finally comes true – but is he up to sustaining it? Plus another great rant from Laiadevorah and another epic adventure in the Kurt series by R_Toady. Thanks for contributing! Happy summer reading everybody! Train is so wonderfully modest, her friends jumped in to make this post. We’re hoping she will make the story available on her blog in the near future. Do check back. Congratulations, Train! Grandma and Grandpa used to sit on the front porch shelling peas. Grandpa went to the garden and picked; everyone shelled. I called myself helping. It seemed to take hours to shell those peas. I’d pop open the end of a pod, run my fingernail down the crease between the halves and scatter out five to six peas into the white enamel colander, the one with the red ring around the edge. Those little green balls rolled around in the bottom of that colander for a long time before we shelled a “mess”. Sometimes, there were eight peas to the pod, on a rare occasion there were nine, and once, I remember eleven. Grandma and Grandpa talked about that particular pod until the butterbeans came in. “You remember that pea pod with eleven?” Grandma would ask. Our sugar snaps are in now. We planted the seeds at the end of February and have watched them sprout, climb and bloom. On Saturday we gathered a handful, thinking there wouldn’t be much of a crop. I was sad because they are my favorites and I look forward to them in the spring. Last year by this time, we had put up freezer bags full. On the way home tonight, the sky was full of storm. Clouds puffed and billowed to the West. The heat and humidity hung around my shoulders when I got out of the car. I had clothes on the line and wanted them in before the shower. I heard thunder as I unclipped the towels, washcloths and tee shirts. When storms gather clouds, dark with wind and rain, everything on the ground seems brighter. The sugar snaps caught my eye, their blooms, extra white, their vines that bright spring green. I hurried over to the garden and found pods hanging, ready to be picked. I ran inside and traded the clothes basket for the colander. I don’t like thunderstorms, never have. I’ve dragged boys off baseball fields, run from the beach, leaving bags, umbrellas and sand shovels behind, and stayed in my car for half an hour to wait out the lightening rather than dash in the house. Today, thunder rumbled and I stayed in the garden to pick. I was quick about it, keeping an eye to the distance. I hadn’t seen lightening, and the rain was holding off. As I rounded one row and started back toward the gate, picking the other, the first fat drop of rain fell. I kept gathering. The booms of thunder were coming closer, and then the distance lit up with lightening. I left my row and ran back to the house as the rain began in earnest. I had the white enamel colander full of peas. I took them to the front porch and sat in Grandma’s rocker to wait for the storm and my family to arrive. 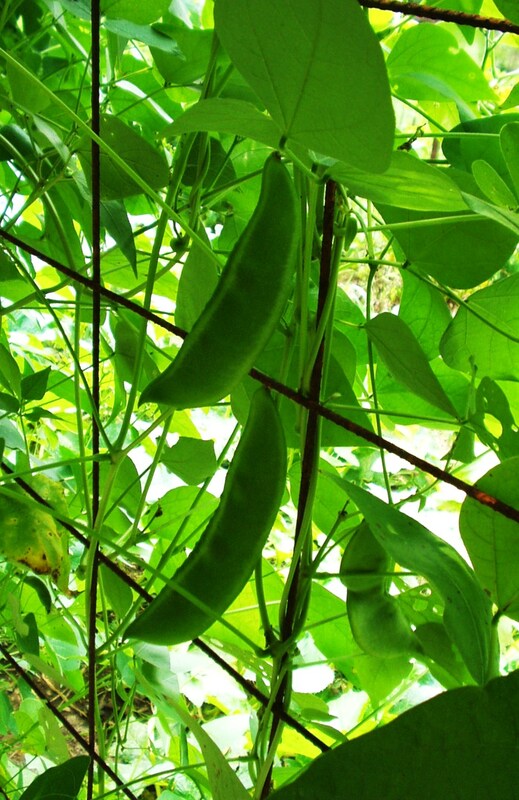 You don’t shell sugar snap peas. You snap off the stem and bloom ends and pop them right into your mouth. That’s what I like about them, they’re quick and easy. There’s no time for all that sitting and shelling these days, what with a forty hour work week, children to haul to sports and school events, and sleep to catch up on. For now, sugar snaps are perfect. Maybe when I retire, I’ll plant some Alderman peas, those are the seeds my Grandpa sowed. I can sit on his same front porch and teach my grandchildren how to shell a “mess” of peas, tell a good story and dream of finding that elusive “thirteen” peas in one pod. I didn’t feel April this year. Although the sepia and gray of winter brightened to greens, yellows, blue skies and high whispy clouds, early Spring passed me. The Crabapples bloomed and the Mock Orange opened its perfume. The birds wake me mornings instead of the alarm and when night comes, the clock says its later than I think. I know the days come and go, they just move fast. Last year, this part of the calendar let me savor it, a taste on my tongue like the first strawberry. This year, the season hasn’t waited for me to enjoy it. May is here and with it, ninety degrees and the humidity that straightens or tightens the curl of hair. Greens are dark now, and blooms, pink two weeks ago, are like tiny pieces of crumpled brown paper littering the ground around the bottom of the Japonica. Bees are flying heavy and slow with collections of pollen and hay grows tall. Buttercups bloom under the barbed wire fence. Shoes come off and soles toughen. June will come with swift water moving down the mountain. I want to be there at the bottom, where the cascade splashes into the reservoir. I missed April, and May is leaving. I want to be ready for, and feel June.